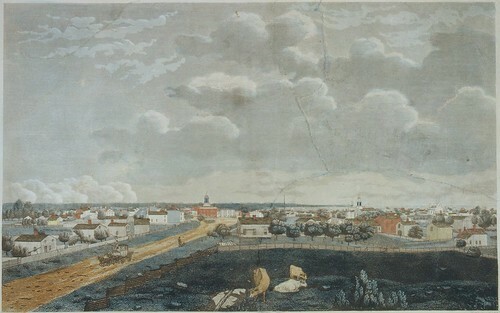 Print by Thomas Whelpley, 1834. 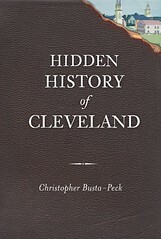 Used courtesy of Cleveland Public Library. Think about the Cleveland landscape in 1833. It still resembled a New England town. Cows grazed at East 9th Street. It was becoming prosperous, thanks to the Ohio and Erie Canal. This landscape seems so far removed from what we know today that it's hard to comprehend this being the same city. Yet, at about this time (some sources say 1832, more say 1838), a building was constructed that stuck around and remained part of downtown life until 1971. 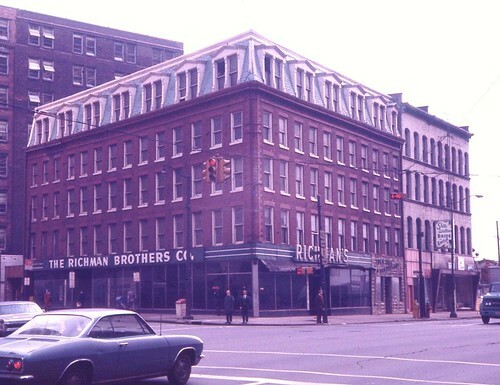 The Mechanics Block was built at the southeast corner of Prospect Avenue and Ontario Street. At the time of its construction, it must have surely been a grand structure, if we are to compare the buildings of a few years prior. To the right, we can see the Stanley Block, which has been condemned and will likely be demolished in the near future. From an ad published in the Plain Dealer, April 5, 1914, page 6. 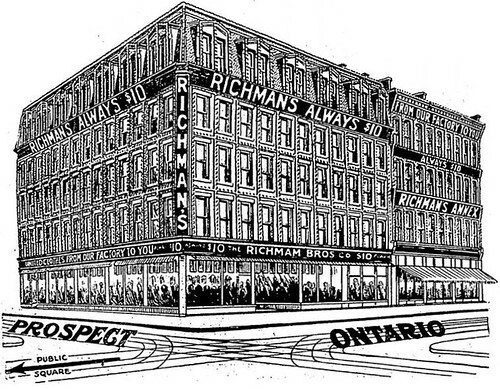 The Mechanics Block housed several schools and other organizations until 1903, when it became home to the Richman Brothers department store. 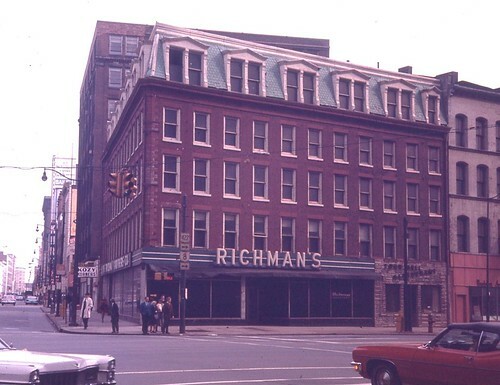 Richman Brothers eventually expanded to fill part of the neighboring Stanley Block. It was not demolished due to structural issues, but rather because the owner no longer wanted it. The demolition of the Mechanics Block did cause some public outcry. It led to the founding of what would become the Cleveland Restoration Society. More action is still needed to keep similiarly significant properties from being demolished. A big part of the problem is building code enforcement. While not the case for the Mechanics Block, it is the situation with the Stanley Block. Violations are not issued for building code problems until they have become such that owners can, conveniently at times, say that the cost of repairs is greater than the value of the building. The purpose of building codes is not just to protect the residents of a given structure, but the neighbors who choose to live, work, or own property nearby. They make decisions based upon the neighborhood as it is, with the expectation that the basic laws of the municipality will be enforced. While I agree that many of the houses that have been condemned recently are in significantly decayed condition, and perhaps even worthy of demolition, I must wonder why something wasn't done sooner, to arrest their decline. Why did we have to wait until they had to be demolished before citing the owners for the code violations? Further, why doesn't the Department of Building and Housing have some tool other than just condemnation? The historical buildings here make up the fabric of what makes the city interesting. In a residential neighborhood, we wouldn't allow the house next door to be demolished to make space for a ten story glass and steel office building - it's not in the best interests of anyone living there. Likewise, in the few remaining historic areas in our city, we shouldn't discard these important structures just because it's what one individual or group desires. It's about the interests of the population as a whole. This is why we have building and zoning codes, and why they need to be enforced. If this means we need stronger laws, so be it. Unfortunately, in this town, building and housing codes are not enforced as a matter of course for keeping the housing stock safe and healthy but too often as a big stick to whack at people. I believe this situation is caused by a complaint driven system. There are no systematic policies in place and too often abstentee landlowrds or banks are allowed to skate until violations "expire". We have seen this happen time and again while other neighbors almost seem to be subjected to a personal vendetta type of handling. Building and housing has to be one of the more disfunctional departments in our fair city. Also when the Landmarks Commission was put under the umbrella of plannig instead of a stand alone commission, more and more it was used as a big stick rather than the advisory capacity that was envisioned for it. Hence, we have a city that does not pride itself in its rich historic heritage but rather one whhich almost has a "disposable mentality" which reinforces newer, shinier, functional, and cheaper are words of the day.